Nestled along the banks of the Susquehanna River in eastern York County, Pennsylvania, the borough of Wrightsville, PA exemplifies small-town living at its finest. Wrightsville is also steeped in history — the town was named for John Wright, an English businessman who established a ferry that shuttled passengers back and forth across the Susquehanna River during the 18th century. The ferry was eventually replaced by the Columbia-Wrightsville Bridge in the early part of the 20th century. The bridge and the Wrightsville Historic District are both listed on the National Register of Historic Places. Today, Wrightsville is a community of approximately 2,300 residents. Wrightsville and neighboring municipalities including the boroughs of Hallam, East Prospect and Yorkana, as well as Hallam Township and Lower Windsor Township, are served by the Eastern York School District. This midsized suburban public school district consists of three elementary schools, a middle school and a high school. In 2013, the Pittsburgh Business Times ranked the district 261st out of Pennsylvania’s 498 public school districts in terms of overall academic achievement. If you’re considering a move to Wrightsville or one of the other Eastern York School District municipalities, you should also consider teaming up with the real estate pros at CENTURY 21 Core Partners. Our listings of homes within the district normally include properties of all types, including a selection of stunning luxury real estate properties offering breathtaking views of the Susquehanna River. As a CENTURY 21 Core Partners client, you’ll also experience the best possible client experience in the York real estate market. The Century 21® brand was the recipient of the highest numerical score from first-time and repeat home buyers in the J.D. Power 2014 Home Buyer/Seller Study. If you’re moving to the Eastern York School District area, prepare to relocate to a region that is rich in American history. 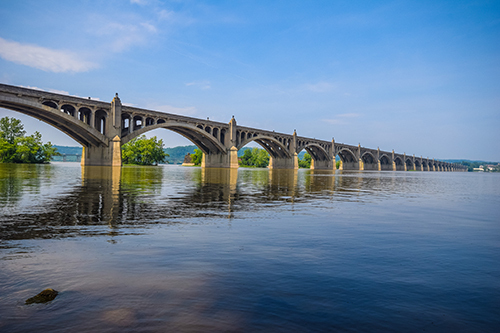 Located along the western bank of the Susquehanna River, this area is well known for historically significant events, especially the burning of the Wrightsville Bridge in 1863 to protect the area from invading Confederate forces. To ease your Eastern York, PA relocation, we’ve prepared this handy relocation guide to Eastern York, PA. The first thing you may want to do upon moving to the Eastern York School District is determine where you will be doing your banking. Although there aren’t a lot of banks in Eastern York, PA, you will find an M&T and a PNC Bank ATM on Hellam Street, 750 and 340 Hellam, respectively. To get your groceries in Eastern York, PA, there’s a little place called Sue’s Food Market on 214 Hellam Street, or a quick hop across the river will take you to Musser’s Market on 960 Lancaster Avenue in Columbia. If you’re looking to do some shopping in Eastern York, PA, you can head over to the Haines Acres Shopping Center, located on Haines Road just off of Route 124. You can also do a little shopping at the John Wright Store. To get a taste of Eastern York, PA, you’ll definitely want to stop in at the John Wright Store and Restaurant. Named for the founder of Wrightsville and located in a beautifully restored warehouse, this restaurant features fresh, locally produced foods that include great burgers, pizza, beers and locally made Allegro wines. The bar features one of the best views of the Susquehanna River around. Happy Hour is from 4 p.m. to 6 p.m. Wednesday through Saturday, and Wednesday is Trivia Night. You’ll find the John Wright Restaurant at 234 N. Front Street. Another great food choice is The Accomac located 6330 South River Drive, York, PA. The Accomac offers a wide variety of food choices and works with local farmers to provide you local, fresh great tasting food. If you live in Eastern York, PA, it’s a short trip to Samuel S. Lewis State Park at 6000 Mount Pisgah Road. Hike up Mt. Pisgah for a great view of the Susquehanna River Valley. Or head to Riverfront Park, parallel to the Susquehanna River, and enjoy picnics, music festivals or just take in the scenery. Eastern York, PA is known for its “Mud Runs,” fun but often grueling multi-mile obstacle courses that involve crawling through mud and navigating various challenges. The “CerebRun” is a popular mud run that takes place in Eastern York. Wrightsville has also been a location for the “National Night Out,” a family fun event designed to “take back the night” for local residents. A great place to begin your search for Wrightsville/Eastern York School District real estate is right here at the user-friendly CENTURY 21 Core Partners website. Click on any property listing to get instant access to professional-grade photos, detailed property information, fun and interesting virtual tours, and useful tools such as affordability calculators, mortgage calculators, downloadable mobile apps and more. Our mobile maps are especially helpful for helping you stay on top of your property search while you’re on the go. You can even schedule a convenient property showing online or with our app. You’ll love our tools and resources, but you’ll enjoy working with our professional real estate agents even more. All CENTURY 21 Core Partners agents undergo extensive training through Century 21® University and at our local office in York. Our agents understand that finding and purchasing a home can be a stressful process. We make a point of handling all of the details for you to remove much of the burden from your shoulders. Are you ready to find the ideal Wrightsville, PA home for sale? Want to learn more about available Eastern York School District real estate? Give CENTURY 21 Core Partners a call at 717-718-0748 or reach us online by filling out our contact form. If you’re interested in getting a firsthand look at properties currently on the market, browse our list of upcoming open houses in the Wrightsville area.